I would love a new TV, but can’t afford it. That is, the cost/benefit ratio isn’t there to replace my 68cm Loewe CRT television just yet. So while I’d love to get a high-definition flat screen with digital tuner, the prices will have to drop a bit more before that becomes viable, especially with the looming cost of braces. Comparing sizes with friends’ TVs, I’m pretty sure I’d want nothing too big — a 32 inch/80 cm screen would fit nicely (without dominating my relatively small livingroom), and some work with a measuring tape and Pythagoras’ theorim verified that even for watching old 4:3 material, that would be bigger than the Loewe. Three-dimensional TV is the big hyped thing now. I can’t judge if it’s good or bad, because it doesn’t work on me — the consequence of having one (almost) blind eye. So while others rave about it (or otherwise), I can only take their word for it. But I wonder if the current hype will last, and will lots of people buy it? If so, will those dowdy old two-dimensional screens drop rapidly in price (the way CRTs did), so before too long I can get a decent one off the nature strip? I feel a little silly for having bought a CRT in 2002 for $1400 that’s now essentially worth nothing, but on the other hand, how would you feel if you’d bought a plasma TV back then for $10,000 that could be bought now for $1000? Interestingly, Loewe have a deal on at moment: rebates for CRT owners who buy a new flat screen. Excellent! I could get a new TV without having to sort out where the old one would go to, and without the guilt of throwing it away! Alas, to get such a rebate involves buying a new TV costing $2999. And that’s the discounted price, after the $1000 rebate. Ouch. Not going to happen. That’s okay. Ultimately, I don’t even need a new TV. The old one still works. Unfortunately. Agree. As long as you can get digital channels (eg, via set top box), stick with the large-ish CRT. Nothing wrong with that! We bit the bullet last year when our (ancient) VCR and (prehistoric) TV died at the same time. Measure the amount of power used by your CRT versus someone with an LCD of about the same size that you’d like (Jaycar have a $30 power meter). I don’t actually know whether the difference would make it worth it, but it might make it worthwhile to buy if it saves you money in the long run. That Loewe deal is ridiculous. First you have to give up your perfectly operating CRT television, with its picture quality superior to most LCDs and some plasmas. Then you have to pay an exorbitant amount for a Loewe LCD which won’t look as good as the Loewe CRT you’re surrendering, or as good as cheaper LCDs and plasmas from other brands. When I saw the ad and emailed for information (which, for some reason, they didn’t print in the ad), I thought to myself that the most ridiculous thing they could offer would be a pretend trade-in offer in which they reduce the price of their overpriced TVs to be nearly as low as an expensive example from a normal brand. Lo and behold, that’s what they did. I laughed when they replied. Get yourself a widescreen CRT on eBay. That’s what I did. $310 for a Loewe Xelos and it’s awesome. Its power supply may blow up one day, but it’s still a bargain. Someone was selling it to make room for a huge (and inferior) plasma. By the way, I did the sums too and I think you got it wrong. A 4:3 picture in the middle of an 80 cm 16:9 screen is a bit smaller than it is on a 68 cm 4:3 screen. And I prove this every time I watch the inexplicably 4:3 Amazing Race on our Loewe. Set top boxes are cheaper. They are about 100 dollars and the anologue signals willbe switched off in mid 2013. On a set top box you will have ABC2/3 Kids SBS2 History One Sports Go Entertainment 7two entertainment. get a computer monitor with HDMI and a set top box. By virtue of it being a computer monitor, you could tax deduct it. We’re still operating with 2 working televisions that are about 20 years old here LOL. Ah well, when they go digital signals here, we’ll have to get digital receivers or replace them I guess. 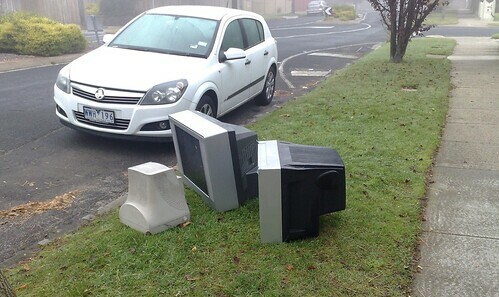 Amazing how fast televisions go worthless after you buy them. Quickly depreciating like computers. Somehow, my family puts up with the travail and anguish of a 27″ (about 68cm) CRT TV. Or perhaps they just put up with me, because I’ve declared that I have no personal budget for a new TV any year soon. My parent’s first color TV, a 26″ jobbie survived for nearly 20 years before it was replaced. Stick with the CRT until it’s done. We bought a 32″ LCD after returning from the USA, and was horrified to learn that LCDs here about double the price they are in the USA, despite near USD / AUD parity. A Tivo will be a better investment – you get SD / HD channels, you can record what you want and watch it when you want minus the ads. Just be warned that Channel 9’s schedule is a work of fiction assembled randomly by dyslexic kittens. And they like it that way. The others are not as bad, but still not good. The longer you wait, the cheaper and better the new telly will be! I reckon that 3D telly will be a big flop. Those of us who have updated our tellies in the past couple of years have either gone for plasma or LCD and, with the digital stuff, are very happy with it. The idea of upgrading for the sake of looking (and feeling) like a right pillock sitting in my living room wearing 3D glasses every night sounds about as much fun as frying up a cat turd! Maybe you need to forget the wriststrap on your wii remote for a bit ;P.
I bought a new Panasonic Viera 32″ LCD HD TV when I moved to Australia in 2008. It has a fantastic picture and it was not too expensive. I was forced into an upgrade as a US NTSC TV is completely useless here in Australia. The previous TV that I had in the US was a 25″ Magnavox that I bought new in 1990. It worked flawlessly for the 18 years that I watched it and as far as I know is still working for the friend who now has it. Daniel, have you tried looking at the used sets for sale in Cash Converters? They always seem to have plenty to choose from and this would be a good way to upgrade to a digital set and still feel smug about saving some money. The LCD sets seem to be cheaper and I think that they have a better picture than some plasma sets do. Why is TV called a “set” when it is 1 piece of equipment?? I bet they still sell NTSC-only TVs in America. Daniel. It is me again. Jeremy and Issac would love more cartoons of there age and entertainment and sports and you would love to see more and better non fiction. in mid 2013 you cant watch analogue TV. Since you aren’t getting one, it doesn’t matter does it, but I suggest you will find 32″ too small. Go for a 42″. I don’t think you’ll regret it. >> I feel a little silly for having bought a CRT in 2002 for $1400 that’s now essentially worth nothing, but on the other hand, how would you feel if you’d bought a plasma TV back then for $10,000 that could be bought now for $1000? In time your current technology will die. Then you can look for something new and better. At the moment I’m recording (on occasion) programs from a digital set-top box to a hi-fi VCR. Eventually the VCR will cash its chips and then I’ll move onto a PVR or whatever other technology is available then. But in reality, I’m not in that much of a hurry. I’ll get something *cool* when I need to. @Phillip, please, PLEASE don’t make wild assumptions about what people may like. You’re wrong. @Andrew, I don’t think so. Having used M+J’s 32″, I think it would be fine. As I say, it’s a small livingroom, and I don’t want the television to dominate it. @Chris, yeah good point. Technology always drops in price over time. Still, there is a sweet spot to be found as far as when and what to buy. If 3D TV came out a couple of years down the track, it might work. However, people are only just getting the whole plasma/LCD thing sorted (I’ve got a nice LED LCD from LG – yes, Triple L. Or L cubed). Not only that, but Blu Ray is still evolving. Too much too soon!